Last week saw the mart trade continue the recovery in prices that began two weeks ago. All average prices on both the bullock and heifer tables are up, and some of them quite significantly. The only exception was the top quarter animal in the 300-399kg bullock section. The most noticeable improvements came not in the 500-599kg division, the section of the trade that for almost the entire year has been the leading light as far as prices are concerned, but in the lighter 400-499kg section. Here overall average prices rose 11c/kg or €44-55/hd, while the top quarter animal jumped 17c/kg which is €68-85/hd. Overall on the bullock table, mean averages rose between 7-11c/kg, with that 17c/kg in the top quarter of the better quality 400-499kg bullock being the biggest jump in terms of overall value of any of the sub divisions. These figures reflect what all the mart managers I spoke to over the weekend told me, that the biggest jumps in price continue to be in the better quality animal. A number of my mini marts have comments from managers saying that the poorer animal, whether bullock or heifer remains a difficult sale. And no doubt they do. However, last week’s Ringside returns show that both the poorer bullock and heifer did recover some recently-lost ground. Indeed, the 18c/kg recovery among the prices paid for those poorer quality bullocks in the 300-399kg division accounts entirely for the fact that average prices overall in this section rose 7c/kg. The next biggest jump in prices for those poorer type steers came in the 600kg+ section where that lesser animal rose 12c/kg, which is a not insignificant €72/hd. From 400-599kg, those poorer type bullocks rose 5-9c/kg or €30-45/hd. The movement on the heifer table is not as dramatic but is still welcome. The section of heifers that saw the most action in the price improvement stakes was the 400-499kg division where improvements in prices were well balanced across the quality divisions. The overall combined average increase was 12c/kg, or from €48-60/hd, with improvements in the prices for the top and bottom quarters finely balanced at 10c/kg and 11c/kg respectively. The 300-399kg heifer rose just 3c/kg on average, although the better conformation heifer at this weight was up 9c/kg. In the 500-599kg section, prices for those better animals at this weight stayed static at €2.31/kg, with the poorer animal improving by a modest €15-18/hd or 3c/kg, leading to overall average prices remaining unchanged at €2.04/kg. Three weeks ago I posed the question as the first of the rains fell across the midlands and south of the country, whether the mart trade was like a coiled spring waiting to be released; last week that spring uncoiled, somewhat. Part of what drove mart prices up last week is down to the fact that factory prices have steadied and are now starting to climb ever so slightly. The other thing is that numbers of cattle at marts also rose. This afforded those who had sold cattle over the dry period the choice last week that had been lacking as sellers had held back waiting for the grass to come. Thomas Potterton reported a surprisingly good show of cattle given the day of the year, plus a good show of buyers. In short, the better bullock was improved, while plainer stock was weaker. “The better one was up by maybe €30-40, but the plainer animal was back by maybe €20,” Thomas said. Bullocks under 500kg averaged €1.70/kg to a top of €2.30/kg, while those over 500kg averaged €1.94/kg to a top of €2.18/kg. 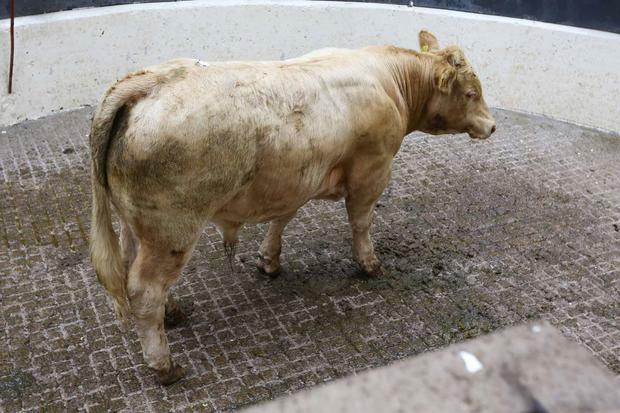 On the heifer side, 335-390kg Charolais made €1.80-2.14/kg, with 400-500kg heifers averaging €2.01/kg. Cull cows averaged €1.45/kg with a 500kg Limousin setting the top bar at €1.84/kg. This was also a strong show of cattle in terms of numbers. And just like Delvin above, the good one was a good trade but the poorer animal was a harder sale. The 300-400kg bullock averaged €2.35/kg with a 360kg Charolais ringing the bell at €1,165 or €3.24/kg. 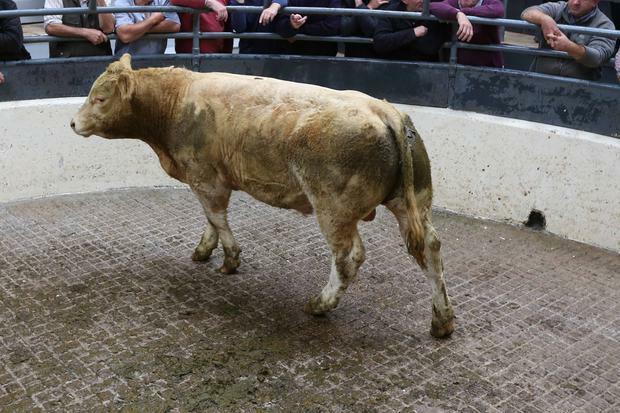 Top of the 400-500kg section saw a 430kg Charolais hit €3.09/kg, while the overall average in this division was €2.24/kg. 500kg+ bullocks averaged €2.12/kg. 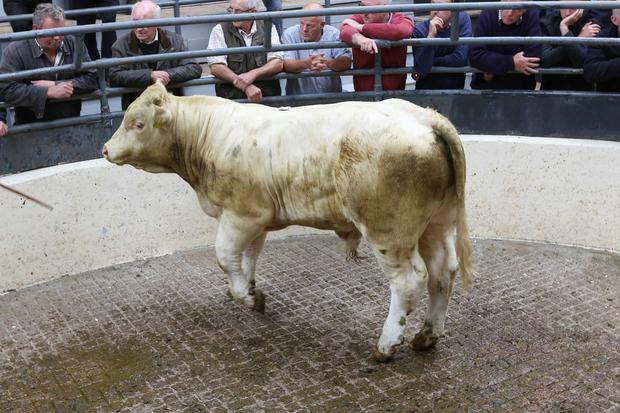 On the heifer side, those up to 400kg averaged €2.18/kg, with the top call being €2.63/kg for a 390kg Charolais. 400-500kg heifers averaged €2.26kg, with heavier lots averaging €2.25/kg. Prices here saw bullocks make €1.18-2.68/kg, with the heifers making €1.88-2.62/kg. That top price per kg among the bullocks went to a batch of three 367kg Simmentals, while in the heifer section, the honours went to a 385kg Limousin. On the weanling side, heifers sold from €2.17-2.75/kg while the bulls ranged from €2.00-2.59/kg. Culls cows sold from €800-1,350/hd. With more farmers ringside, prices for weanling heifers were reported as being improved by €20-30/hd. 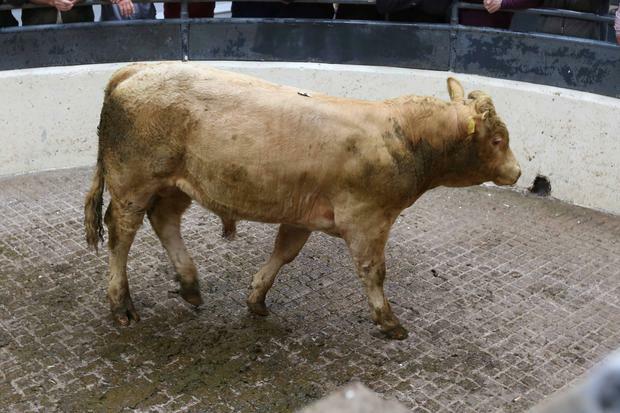 Among those improved heifer prices were a 265kg Charolais who sold for €2.92/kg, three 328kg Limousins at €2.60/kg and a 400kg Charolais that sold for €2.86/kg. 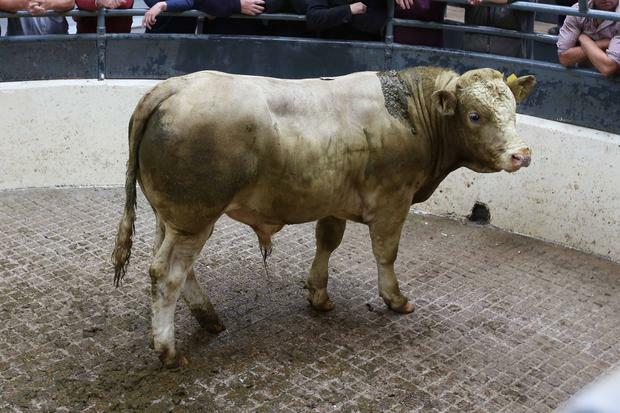 Among the bulls, prices also cracked on well with a 280kg Charolais setting the top bar at €3.19/kg. He was hard put to it though by the Limousins, with a 385kg contender coming in at €2.95kg and another at 335kg making €3.00/kg. Numbers rose here last week as both buyers and sellers recognised that with grass recovering, the time was right to move. On the bullock side, sample prices included a 495kg Limousin at €2.46/kg, a 500kg Charolais at €2.38/kg with two 420kg Charolais and a 420kg Aberdeen Angus all making €2.38/kg. On the heifer side, you had a 525kg Limousin at €2.17/kg, a 400kg Aubrac at €2.07/kg, and a second Aubrac at 380kg which came in at €2.10/kg. The national trend of good cattle making more, and the lesser bullock making less continued here. Forward stock sold well, while the plain Friesian, Hereford and Angus type was a difficult sale. Heavy bullocks made €1.85-2.20/kg, with forward types making from €1.95-2.40/kg, while the lighter store sold for €2.00-2.65/kg. Weanling bulls made from €2.00-2.65/kg, with dry cows selling in the €1.20-1.80/kg range. Barney O’Connell noted that there were more people about and a lift in the trade at his most recent sale. “It was tough here the last few weeks but this sale was better. There were more people about, more hands in the ring and a better air about the place,” Barney said. Prices for “nice” 300kg heifers ranged from €1.80-1.90/kg, while in the bullock trade, most of the better-type Friesian, Angus and Herefords sold from €1.65-1.90/kg. Cull cows averaged in general from 75c/kg to €1.50/kg. Previous article‘The use of the sexual device as a prop, in my mind, it made sense’ – Daniel Roberts explains his actions on Who Is America?